Poundmaker, a chief of the Cree nation, was born near Battle ford, Saskatchewan in 1826 . He participated in the negotiations leading to the signing of Indian Treaty No. 6 in 1879 and settled on a reserve on Battle River, Alberta. On the outbreak of the North West Rebellion he besieged Battle ford, and later commanded the Indians at the battles of Cut Knife Creek and Batoche. Following the capture of Louis Riel in 1885 he surrendered to Major-General Frederick Middleton, was tried at Regina and sentenced to three years imprisonment. 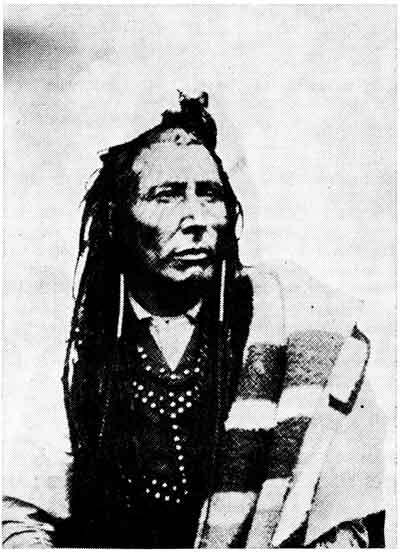 He was released, however, after a year’s confinement and died shortly afterward on July 4, 1886 near Calgary while on a visit to Crowfoot, Chief of the Black-foot Indians. When he heard the sentence, “Imprisonment for three years,” he said, “I’d rather be hanged.” Perhaps he suddenly thought of his hair, those long, black braids. To have them shaved off, as was the prison custom, would be, to an Indian, a fate equivalent to scalping. As a savage he had torn the liver, still warm, from a buffalo killed in a hunt staged for a Governor-General. While in jail he was baptized a Christian and took an Archbishop’s name. Canon Ahenakew remembers Poundmaker’s son  Sakamataynew  whose Cree name means “tongue-tied” for it was the Canon who baptized him and gave him the same Christian name  Alexandre  which Poundmaker had taken when he was baptized by Alexandre Tache. Poundmaker, over six feet tall, and of commanding appearance, walked with his head high and black braids proudly displayed when he met two Governors-General. In 1881, he was a guide for Marquis of Lorne on a buffalo hunt on his own reserve. In 1885, when the Marquis of Landsdowne visited Stoney Mountain the tall Indian Chief was presented to the Governor-General by the warden Col. Samuel Bedson. The Governor-General said he was sorry to meet Poundmaker under such circumstances. Poundmaker “conducted himself with stoical in-difference” wrote a news reporter of this meeting. Poundmaker’s own rifle is on display in the Manitoba Museum, in Winnipeg. It is a Winchester, 1866, which was purchased at auction in England in the Spring of 1959. Richard Sutton, the Museum curator, saw it advertised in a catalogue and cabled his bid.